Like it or not, the sharing economy has taken flight. And whether you’re a seasoned business owner or an aspiring entrepreneur sketching business dreams on cocktail napkins, a new report suggests you consider its impact on your business, or risk flying against the wind. Access trumps ownership is the mantra of peer-to-peer businesses; if you can rent a bike when you need one, why bother owning one? Thanks to the smartphones tethered to our fingertips, these kinds of transactions can be done with the swipe of an app. While the sharing economy may have been born by the tech savvy in Silicon Valley, almost half -- 44 percent -- of U.S. consumers are currently aware of it, according to a survey of U.S. consumers conducted in December. 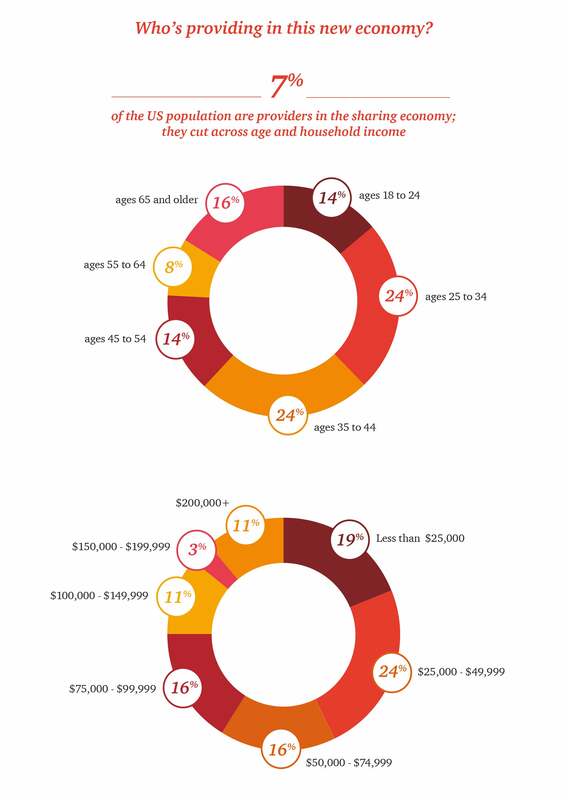 And the sharing economy is being used across age groups and income brackets (see infographic below). Consumers think sharing makes life more convenient, less expensive, builds community, is more sustainable than traditional ownership models, and is more fun, according to the PwC survey. Meanwhile, they still have concerns about reliability and trust. Even if you aren’t all that interested in environmental causes or are creeped out by the idea of staying in a stranger’s spare bedroom when you travel, it’s good marketing to incorporate the sharing economy into your business image. That’s because the recession permanently changed consumer behavior, leaving in its wake an appreciation of a more minimalist lifestyle, according to the report. If you position your brand as embracing the sharing economy, you’re likely to attract the eyes of the ever-increasing slice of society that cares about sustainability. Big, corporate brands are taking notice of the changing consumer sentiment. For example, Citibank made a pretty big bet on the sharing economy with the installation of its Citi Bike program in New York City, which allows people to borrow a bike from one parking station and return it to another across town. For the financial giant, getting in on the sharing economy was savvy marketing more than anything else. This shifting in consumer sentiment may feel overwhelming, especially for retail businesses. But it can also be an open door to a new revenue stream. “A threat to retail can just as easily be flipped into a tremendous opportunity,” says the report. For example, if you are already selling bikes, and new bike-rental companies are cutting into your profits, you might consider adding on a service that connects consumers with the best rental deals. Or, if you own a retail store, perhaps you can rent out your space with retail-space rental platform Storefront when you aren’t using it to make additional money. The sharing economy is big and only showing signs that it will continue to get bigger. As an entrepreneur, you don’t really have a choice as to whether you will confront these changing consumer behaviors. Rather, your question is how will you upgrade your business model to address the inevitable. Related: Lyft CMO: Uber Is the Wal-Mart of Transportation. We Aren't.